We are going to be showing off the game to all of you! YES! You can come on up and check out our efforts for the last two months of development. Yup, two months! It's crazy, but we have a playable build! It's very very early on, but you can play the pre-alpha build and see where this project is heading. Who knows, if you have some great feedback to give us, it may make it into the game. Frankly, I am very pleased with how pre-production has been going and where the game is sitting currently. I will be posting screen shots very soon of the project from it's very early roots to where it is now as we go to PAX. I would like to thank Logitech in being so very cool and giving us a space at their booth to show off the game. They are our best partners in… crime! Seriously though, without their support going to PAX would have been a tougher feat to accomplish. Being able to show the game off on the showroom floor gives us a crazy amount of visibility. Logitech has shown that they believe in our project and us as a company and that vote of confidence is HUGE! 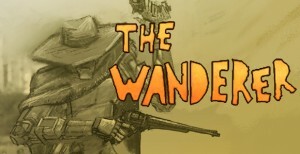 Making The Wanderer has been blast! This game has challenged us in a new ways and we cannot wait for all of you to be able to see what we have so far.